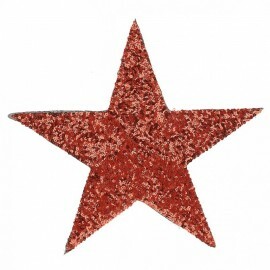 You'll adore this XXL star-shaped patch, embroidered with shiny red sequins. 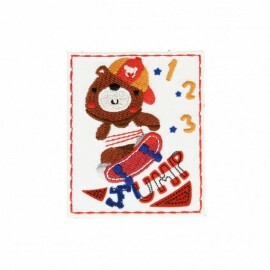 Place this large iron-on patch on a tee-shirt, a sweater or to decorate your interior! 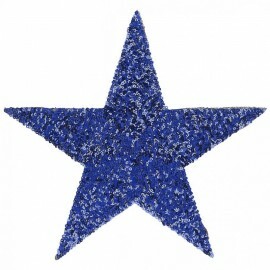 You'll adore this XXL star-shaped patch, embroidered with shiny blue sequins. Place this large iron-on patch on a tee-shirt, a sweater or to decorate your interior! 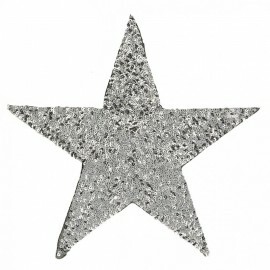 You'll adore this XXL star-shaped patch, embroidered with shiny silver sequins. Place this large iron-on patch on a tee-shirt, a sweater or to decorate your interior! You'll adore this XXL star-shaped patch, embroidered with shiny golden sequins. Place this large iron-on patch on a tee-shirt, a sweater or to decorate your interior! 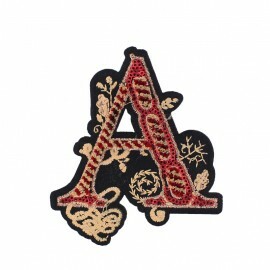 A as Adore, Anna, Alice... Personalize your clothes and accessories with this beautiful Fancy A Letter iron-on patch with shiny sequin embroidery. 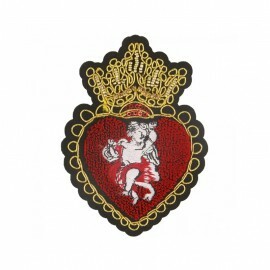 Add some fantasy with this royal red heart iron-on patch! We like its original heart shape and the enchanted side it'll give to your clothes and accessories. Discover the 'Royal Angel' patch for some chic and refined creations! You'll appreciate its golden thread and embroidered beads. It'll make your classic sweater very fashionable! 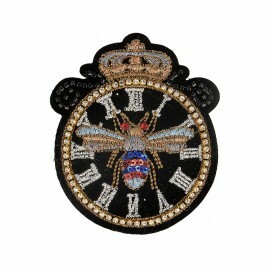 Discover the 'Royal Clock' patch for some chic and refined creations! You'll appreciate its cooper thread, embroidered beads and rhinestones details. It'll definitely be a success on a your purse! Gold skull-shaped iron-on patch from the Glamstar collection. 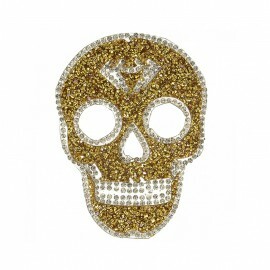 Customize your clothes and accessories with this skull patch made of rhinestones. Placed on a bag or a jacket, you'll shine a thousand lights! Black pineapple-shaped iron-on patch from the Glamstar collection. 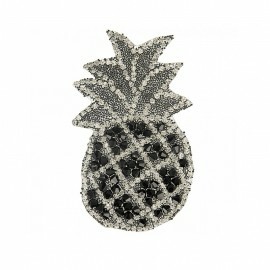 Customize your clothes and accessories with this pineapple patch made of beads and rhinestones. Placed on a bag or a jacket, you'll shine a thousand lights! 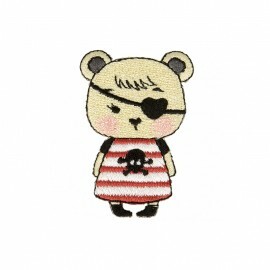 Black glasses-shaped iron-on patch from the Glamstar collection. 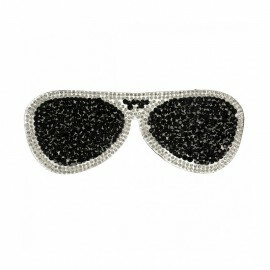 Customize your clothes and accessories with this glasses patch made of hundreds of rhinestones. You'll shine a thousand lights! 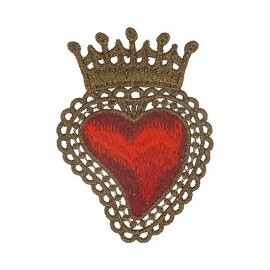 Red heart-shaped iron-on patch from the Glamstar collection. 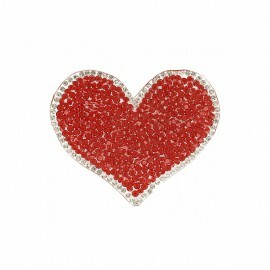 Customize your clothes and accessories with this heart patch made of hundreds of rhinestones. You'll shine a thousand lights! Red lip-shaped iron-on patch from the Glamstar collection, available in two sizes. 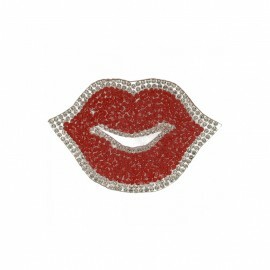 Customize your clothes and accessories with this lip patch made of hundreds of rhinestones. You'll shine a thousand lights! Blue star-shaped iron-on patch available in two sizes. 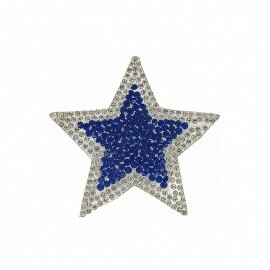 Customise your clothes and accessories with this star patch made of hundreds of rhinestones. You'll shine a thousand lights! This tricolor star shaped iron-on patch is available in two sizes. 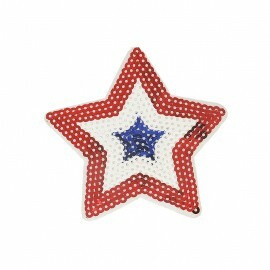 Customize clothes, accessories and events with this blue red white star patch. 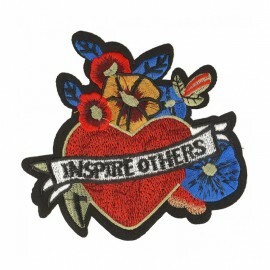 This 'Inspire Others' iron-on patch is available in 2 sizes. It is perfectly adapted to embellish a decorative cushion in a child's bedroom, on a gym bag or placed on the back of a long sleeve tee-shirt. 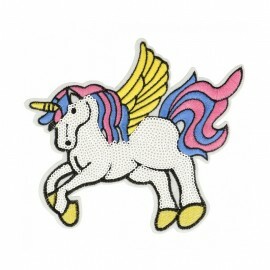 This large 'Winged Unicorn' iron-on patch is available in 2 sizes. It is perfectly adapted to embellish a decorative cushion in a child's bedroom or placed on the back of a long sleeve tee-shirt. Discover the "Naval Army" iron-on patch pack, with golden thread embroidered patches for some very personalized creations! 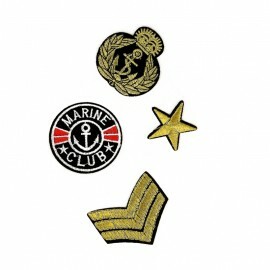 In this pack, find a golden star patch, a military rank patch, a 'Marine Club' patch as well as a golden embroidered royal navy patch. Give your clothes a yummy side with the Fruit & Love iron-on patch pack! 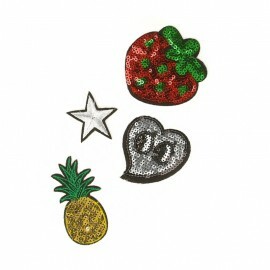 Find in this pack a sequin strawberry patch, a sequin heart patch, a sequin pineapple patch and an embroidered silver star. Give your clothes a rock'n'roll side with the Peace & Rock iron-on patch pack! 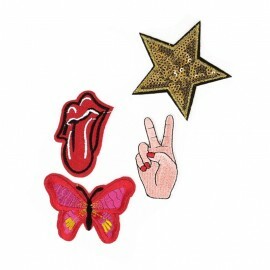 Find in this pack a sequin star patch, a rock'n'roll tongue patch, a butterfly patch and the V sign patch for peace and victory. 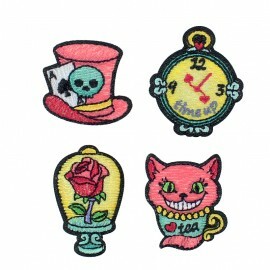 Alice in Wonderland's fans will love these iron-on patches inspired by the movie! These little patches are colorful and nicely woven. Add your own discreet touch with these patches, iron them on your favorite jacket or a pair of jeans. 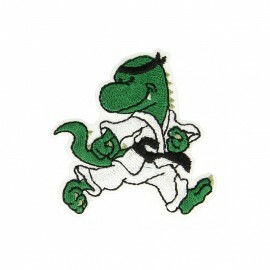 On your clothes or accessories, the green Karateka Dino will make children and adults happy! Karate fans will mix and match the 2 designs ! 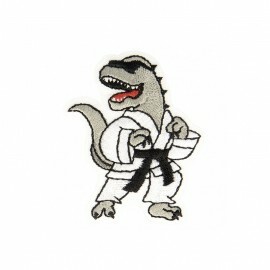 On your clothes or accessories, the Karateka Dino will make children and adults happy! Karate fans will mix and match the 2 designs ! Give a funny and colorful side to the little ones' clothes and accessories with the "Funny Monsters" patches. 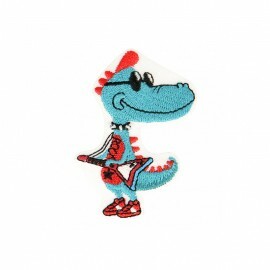 Children will definitely fall under the spell of the "Rock" little monster patch. Give a funny and colorful side to the little ones' clothes and accessories with the "Funny Monsters" patches. 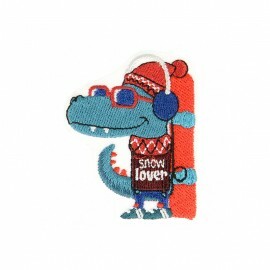 Children will definitely fall under the spell of the "Snow Lover" little monster patch. Give a funny and colorful side to the little ones' clothes and accessories with the "Funny Monsters" patches. 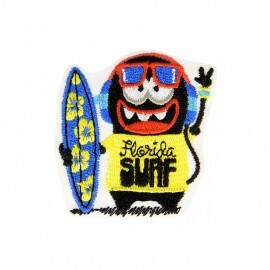 Children will definitely fall under the spell of the "Florida Surf" little monster patch. Give a funny and colorful side to the little ones' clothes and accessories with the "Funny Monsters" patches. Children will definitely fall under the spell of the "Security - I love my mom" little monster patch. Give a funny and colorful side to the little ones' clothes and accessories with the "Funny Monsters" patches. 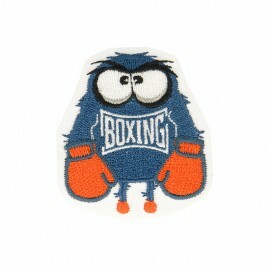 Children will definitely fall under the spell of the "Boxing" little monster patch. Ninon & Timoté love costumes from everywhere in the world ! 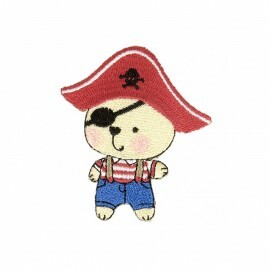 Discover now Ninon dressed as a pirate girl girl. Iron on this patch as it pleases you, on a simple white t-shirt or to complete a cute child look. Ninon & Timoté love costumes from everywhere in the world ! 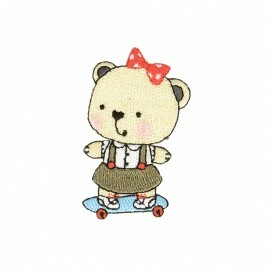 Discover now Ninon dressed as a chic skater girl. Iron on this patch as it pleases you, on a simple white t-shirt or to complete a cute child look. Ninon & Timoté love costumes from everywhere in the world ! Discover now Timoté dressed as a chic skater boy. Iron on this patch as it pleases you, on a simple white t-shirt or to complete a cute child look. Ninon & Timoté love costumes from everywhere in the world ! 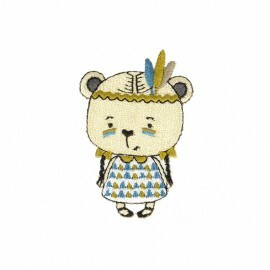 Discover now Ninon dressed as a native american girl. Iron on this patch as it pleases you, on a simple white t-shirt or to complete a cute child look. Ninon & Timoté love costumes from everywhere in the world ! Discover now Timoté dressed as a native american boy. 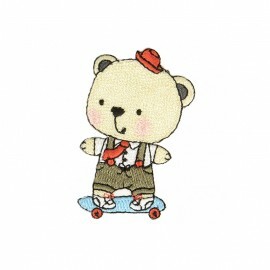 Iron on patches as it pleases you, on a simple white t-shirt or to complete a cute child look. Go explore Argentina on the back of real llamas! 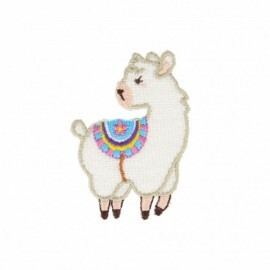 Visit its breathtaking landscapes such as Pampa, Patagonia... Or we can also suggest you to simply choose this superb sponge llama D iron-on patch with colorful embroidered saddle. It's faster to get and not as expensive. You'll add some latino style to your look before the big departure! Go explore Argentina on the back of real llamas! 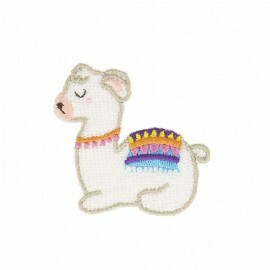 Visit its breathtaking landscapes such as Pampa, Patagonia... Or we can also suggest you to simply choose this superb sponge llama C iron-on patch with colorful embroidered saddle. It's faster to get and not as expensive. You'll add some latino style to your look before the big departure! Go explore Argentina on the back of real llamas! 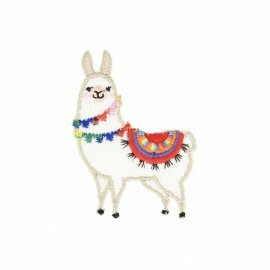 Visit its breathtaking landscapes such as Pampa, Patagonia... Or we can also suggest you to simply choose this superb sponge llama B iron-on patch with colorful embroidered saddle. It's faster to get and not as expensive. You'll add some latino style to your look before the big departure! Go explore Argentina on the back of real llamas! 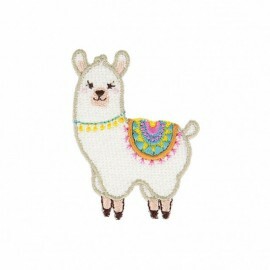 Visit its breathtaking landscapes such as Pampa, Patagonia... Or we can also suggest you to simply choose this superb sponge llama iron-on patch with colorful embroidered saddle. It's faster to get and not as expensive. You'll add some latino style to your look before the big departure! Basketball, soccer, skating... 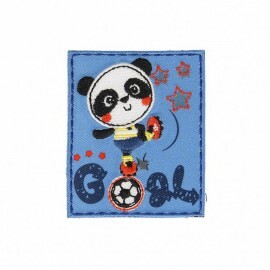 Choose your favorite sport among the patches from the Baby Sports collection. Apply it on a changing bag, sleep sack or pretty overalls... and baby will be so proud! Basketball, karting, skating... 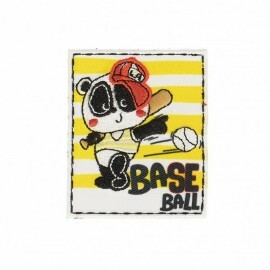 Choose your favorite sport among the patches from the Baby Sports collection. Apply it on a changing bag, sleep sack or pretty overalls... and baby will be so proud! Basketball, basketball, skating... 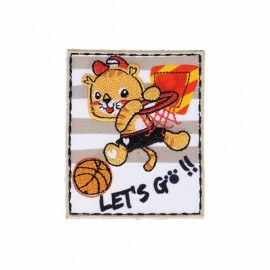 Choose your favorite sport among the patches from the Baby Sports collection. Apply it on a changing bag, sleep sack or pretty overalls... and baby will be so proud! These cute emoji-style patches are classics of the decade and always trendy on a denim jacket, a backpack or to personalize any clothes or accessories. Choose the star-shaped Smiley Star C iron-on patches for a very 2000 look! These cute emoji-style patches are classics of the decade and always trendy on a denim jacket, a backpack or to personalize any clothes or accessories. 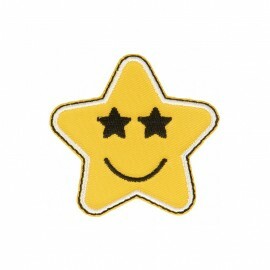 Choose the star-shaped Smiley Star B iron-on patches for a very 2000 look! These cute emoji-style patches are classics of the decade and always trendy on a denim jacket, a backpack or to personalize any clothes or accessories. Choose the star-shaped Smiley Star A iron-on patches for a very 2000 look! Meet Samantha, the first of the triplet sisters. Creative and malicious, she doesn't like rules very much. 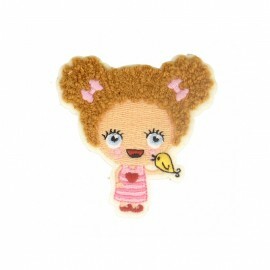 Collect the triplet sisters patches, you'll definitely love their extravagant curly hair! Meet Charlotte, the first of the triplet sisters. Loving and always smiling, she loves animals. 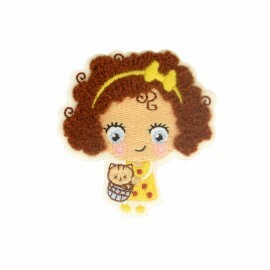 Collect the triplet sisters patches, you'll definitely love their extravagant curly hair! Have you always dreamt of making embellishments by your own ends? Do it and do it great thanks to our customization and DIY supplies for every stage of success: beginners, experts, and craft enthusiasts. At first, Handicraft is the traditional name for this field that is craft. In fact, back in time, crafts were created by people in need of useful, and practical tools. They needed these materials and created them with their own hand. Nowadays, crafts are everywhere! On Pinterest, at school, at home, on Instagram, you are confronted with inventive, accomplished, and crafty person sharing their latest inventions and creations. We think it is your turn to try out and design the elements you want but can’t find ready to wear in store. 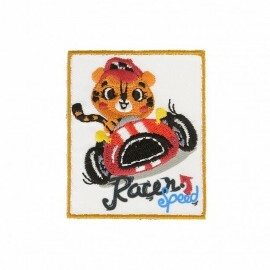 Indeed, either you aim to try a new embroidery project or a simple and fast craft project, we have the supplies for that. With more than 5,000 craft items and crafting supplies, we have plenty to keep you busy! Be sure to find the perfect supply for your handicraft project. Do you aim to try a new hobby? Do you want to become an artsy-craftsy person this year? Time has come for you to embrace yourself, ease stress, increase your dopamine, and start actually creating handcrafted elements from scratch. After work or on rainy Sunday afternoons, stitch, stick, imagine, and let your hands shape new elements. Here at Ma Petite Mercerie, we broad a number of different options for you including knitting, embroidering, sewing, collage, and so forth. Looking for the best craft shops near me? Stay on your sofa, grab a cup of coffee and start shopping online for customization supplies, and more! 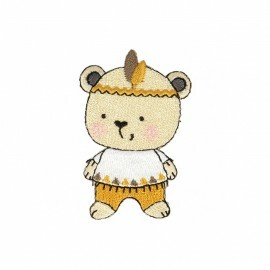 Ma Petite Mercerie is the best craft and haberdashery shop online! Indeed, your online fabrics and DIY store offers a wide variety of materials and tools, to give you the opportunity to stitch soft animals, bags, embroidery, and more. Find padding, toy filling, and cherry stones for cushion making. Be imaginative! When crafting, you want to find convenient and efficient accessories, in order to make things right and design the perfect accessories or pieces of art. At your online fabric store, we try our best to gather the highest quality possible when it comes to customization supplies, cutting tools, iron-on patches, stickers, ribbons, yarns, feathers, collars, felt, flowers, strass, and cushions. Discover, as well, lamp kit, lamp foil, felt kit and embroidery kit with embroidery hoop for creative kids and adults, and improve your creative mind. In the mood for spending some quality time scrapbooking and decorating your summertime memories images? Pick our practical and high-quality hot glue gun, masking tape, and self-adhesive paper. In addition, find practical creatives tools as pompom maker, heat transfer, paint pot, textile paint pen. Moreover, we do also provide you with unique embroidery yarns, wooden embroidery hoops, and so forth, perfect for your embroidery projects. Furthermore, you will find the best material for bag making: d-rings, bag handle, buckle, snap hook, pendant, hemline bag clasps, and bag chains. Find as well all about kids activities, from colouring pen to craft glue, customization tools, easy DIY activities, and hobby ideas. Questioning our products? You wish to find a material in particular but can’t find it on our website? Don’t hesitate to email us and we will try our best to find what you are looking for. Thanks to our wide range of hobby articles and fun craft projects, be sure to design unique and pretty items for everyone. Do you wish to organize your kids’ birthday and want their friends to come back home with a crafty memory of this unforgettable day? Buy our festive spirit felt kit and help them imagine cute felt foxes, tigers, small birds, and more, thanks to our textile fabrics, fabric glue, and toy filler. Shop our wicker baskets and brighten it up with fluffy pompon trimmings, ribbons and finest embroideries. Once you are done with it, you can label your creation with some of our “homemade” labels. We do also offer teething rings for you to personalize your teething ring. Stitch a nice little fabric to your teething ring and gift it to a newborn. Thus, you can sell your creation or deliver them as presents to your beloved tribe. Be wild and customize your favourite pair of trousers thanks to our embroidered iron-on patches. Replace your old shoelaces with a nice Liberty ribbon. Attending or organizing bachelorette parties? Find nice and original creative ideas on our sewing and home decor books and begin your artsy project with our affordable supplies. Custom made your very own custom made tote bag collection and write down the name of the bachelorette on it, with shiny paint or glitter fabric. Looking for DIY projects to try out easily for this Winter? Fall in love with our DIY crafts books and get genius ideas that you will be able to redo with your own supplies, fabrics and imagination. Christmas is right around the corner and for this season, the homemade home decor is the new trend. Use our coloured paints, textiles pens, felt, all in Christmassy colour, and put your personal touch with glitter fabrics. Finally, decorate your Christmas tree and celebrate Christmas with some arty projects. Find our best selection of card making supplies, and create your own decoration bits and Christmas cards, with family members and friends, before Christmas Eve.